The Spanish EnerOcean has launched its floating wind turbine prototype W2Power at the Astican Shipyard in Gran Canaria. W2Power, built and assembled at the Astican Shipyard, will be installed at the PLOCAN offshore test site in the coming weeks, project partner Ghenova said. According to the company, sea trials in a real environment are the next step prior to commercialization. Ghenova was in charge of developing the hydrostatic and hydrodynamic response calculation and structural behavior. 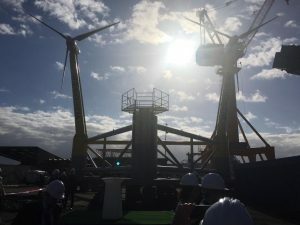 “We are pleased to receive more than fifty Spanish and international experts, industry executives, associations and representatives of the public sector at the opening of our first W2Power platform that will soon be tested at sea,” said Pedro Mayorga, President and Technical Director of EnerOcean. Ghenova stated that W2Power can feature two turbines with a respective capacity of 6MW, which can offer greater power generation without increasing the use of steel in construction, thus allowing cost reduction.